The rhinoceros is an animal that comes from Asia and Africa. There are not many of them left because they are being hunted for their horns. People have the idea that their horns make good medicine, which is actually not true. The last rhino in Viet Nam was killed four years ago and sold to people wanting to make medicine. Now, South Africa is losing its rhinos to such killings. A record 1,004 rhinos were killed for their horns in South Africa in 2013. HA NOI (VNS)— A leader of a campaign to stop global trade in ivory from elephants and rhinoceros has praised the Vietnamese Prime Minister, Nguyen Tan Dung, for speaking out on the issue. Elisabeth McLellan, co-director of the World Wildlife Fund International's Global Wildlife Trade Campaign, described the commitment as a turning point in the fight. She was speaking at the first World Wildlife Day in Ha Noi yesterday. "The Prime Minister is sending a clear signal to his Government and citizens that the illegal wildlife trade in elephant ivory, rhino horn and other products will not be tolerated." Last month, the Prime Minister issued a directive that the fight against the trade be made at all levels and across all ministries. He was directing his words particularly at those trading wildlife products across regional and world borders. Deputy Minister of Agriculture and Rural Development, Ha Cong Tuan, said Viet Nam "had expressed its willingness to co-operate with all Convention." Conservation and animal protection organisations working in Viet Nam have asked the public to say "no" to wildlife products, in particular to support efforts to tackle the escalating demand for rhino horn. Earlier, at a high-level conference in London, Viet Nam and 45 other countries and 10 intergovernmental organisations agreed to tackle the illegal wildlife trade that is killing thousands of elephants, rhinos and other endangered species each year. A campaign asking people to Stop Using Rhino Horn was launched here yesterday. It calls on all Vietnamese to refuse to buy the product, thus increasing protection for the threatened rhinoceros of Africa (the last Vietnamese rhinoceros was shot and sold four years ago). The new campaign is part of an international campaign organised by WildAid, the African Wildlife Foundation and the Vietnamese non-governmental organisation CHANGE. Vietnamese TV, radio stations and news outlets have offered free broadcasts and advertisements worth more than US$1million to spread the message that: "When the buying stops, so does the killing." Experts claim Viet Nam is one of the largest markets for rhino horn due to an ignorant belief by sexually deficient men that it can make them virile - and to those who wrongly believe it can cure cancer. At the launching event, Deputy Minister of Information and Communications Truong Minh Tuan said the Government was committed to protecting wildlife through educating the public and strengthening the legal framework. Tuan said the illegal use and trading of rhino horns and other endangered species had had negative effects on the image of Viet Nam. According to WildAid, the Stop Using Rhino Horn campaign focuses on the world's two largest markets for consuming rhino horn: Viet Nam and China. Patrick Bergin, African Wildlife Foundation CEO, said that the last rhinoceros in Viet Nam had been killed by poachers and its horn taken. "We need the people of Viet Nam to ensure Africa's rhinos don't suffer the same fate as Viet Nam's rhinos by saying "no" to rhino horn before it's too late," Bergin said. A leader of a campaign to stop global trade in ivory from elephants and rhinoceros has praised the Vietnamese Prime Minister, Nguyen Tan Dung, for speaking out on the issue. If two or more people are directors of an organisation, they are co-directors. Commitment means putting all your loyalty and effort into something. A turning point happens when things seem to be going in a new direction. To tolerate means to allow things to happen without stopping them. A directive is an order. When there is escalating demand for rhino horn, it means people want it more and more. Endangered species are animals and plants that are so rare they are in danger of disappearing altogether. When people are ignorant about something, they do not know much about it. Deficient means not having enough of something. Virile means being like a man. The image of Viet Nam is what people think of the country. To consume something means to buy it and use it. 1. Lots of people in China use rhino horn as medicine. 2. 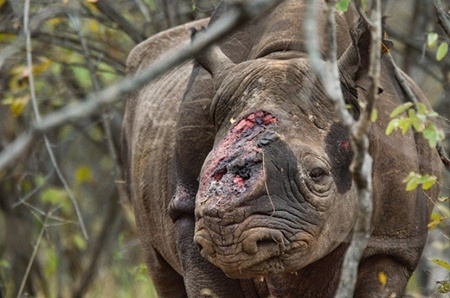 Never until last year had as many as 1,004 rhino been killed in one year in South Africa. 3. There are still rhinoceros living in the forests of Viet Nam. 4. Elisabeth McLellan is the only director of the World Wildlife Fund International's Global Wildlife Trade Campaign. 5. Ha Cong Tuan works for the African Wildlife Foundation. 1. True; 2. True; 3. False; 4. False; 5. False.